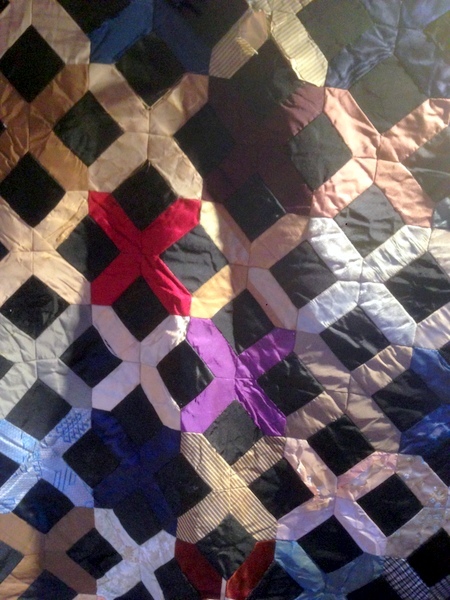 As part of the C&G Diploma in Patchwork and Quilting that I am teaching, the students are required to produce an illustrated history of the past two hundred years of patchwork and quilting. This is an area that interests me and I have a number of books on the subject, but no actual examples for them to examine. 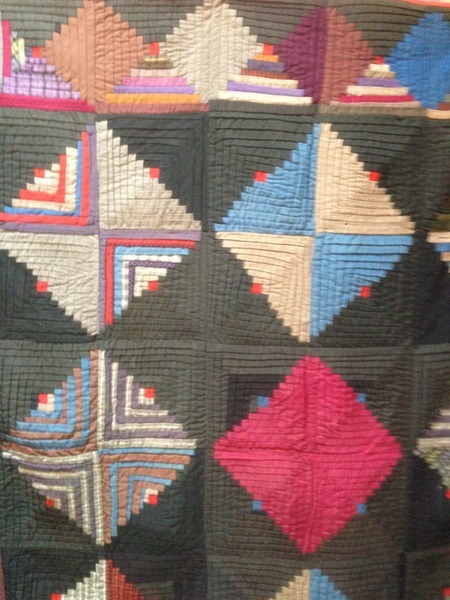 And seeing real quilts brings it to life. So the hunt was on to find some antique quilts reasonably locally. Whilst Glasgow Museums has a great collection of embroidery, there are not many quilts in their collection and apparently it is very hard to get an appointment to view them (I'm willing to be corrected and visit the collection if I've got this wrong!). 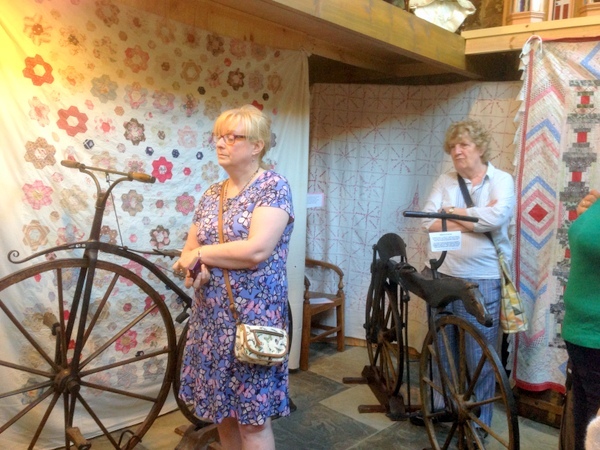 One of my students in the other Diploma class, Catherine Palmer, had been investigating where she could see quilts and had made a visit to Fife Folk Museum last year, where a lovely volunteer, Margaret, had looked out all the information she could find on the quilts in their collection. 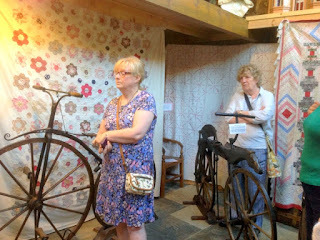 So I got in touch and on Tuesday we went to see the quilts. As it is a bit of a distance from here, we combined it with a trip to Wemyss School of Needlework, which is relatively close by. Wemyss does not have a huge collection of quilts, but it is also good to be aware of other forms of stitching and they had some lovely examples of embroidery. The sun shone and it felt like a bit of a road trip - especially when the sat nav on my phone directed us to the waste transfer station in another village 15 minutes away! On the huge table there were some examples of quilting laid out for us, along with some exquisite embroidery and records of the people who made them. Fiona Wemyss gave a great talk, setting the collection in context and then we were free to look around for a closer examination. Photos of specific textiles were not allowed, but general shots were, which is what I have here. There was also a well stocked embroidery shop, which was raided by many of the students (and me!). 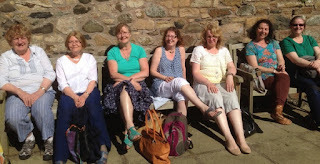 On to Ceres, to Fife Folk Museum, and they had not fibbed when they told me it had a great cafe! The cakes were wonderful. 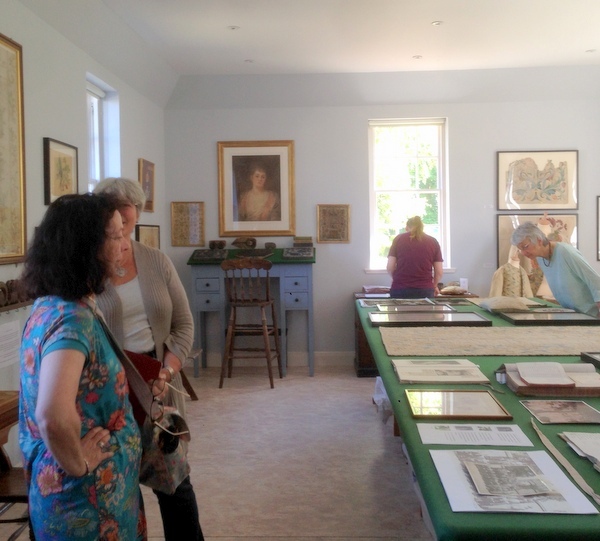 We had a private viewing of the quilts which had been specially hung by some of the volunteers. 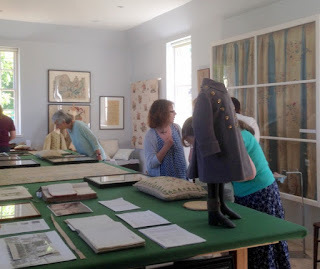 We had a lovely session examining the quilts and the records in detail, sharing our knowledge of quilts with the volunteers, whilst they filled us in on the history that accompanied those quilts. My photos are not great or numerous as my phone battery was almost dead by this point! I'd highly recommend a visit to either place and will definitely be revisiting the Fife Folk Museum soon - it had lots of other interesting things to see, but we ran out of time. Well, actually, we chose to have coffee and cake rather than running round the other galleries! Thanks Lesley. 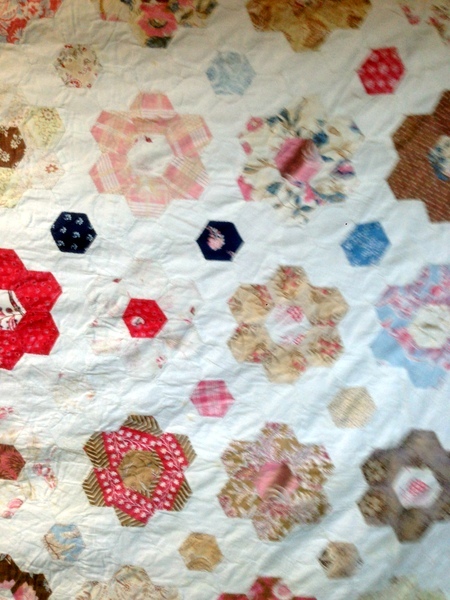 These quilts were all made locally in Fife. There are quite a few books, old and new about British quilt history and I believe that Janet Rae has another one due out over the summer. Books by Janet Rae and Dorothy Osler are good - I'll write another post about books I have in my library on historic quilts, to give you more info. Lovely, thanks for all that, Gillian. Look forward to hearing more about your quilt library.